Having a multi-faceted approach to hiring for your organization is crucial for long term success. As we offer the most competitive salary numbers in our 2015 Salary Guide, there are several other skills a business needs to recognize when finding the right candidate. Can we contribute engaging in social media as an asset to financial professionals? When asked to define the nature of social media, many would describe the various networking platforms as a personal approach to connecting with friends through unique mediums. If you ask what makes social media valuable for a finance professional, many would proclaim it’s a professional tool for collaboration and learning through groups and forums. But can your business leverage your financial employees engaging in social media for the future success of your organization? While finance can be a detail-driven subject, groups on LinkedIn and other social platforms are a great way to stay on top of the latest trends and new developments in finance that produce multiple opportunities for innovation and execution. Leading experts in a range of financial topics, are all active contributors and publishers to LinkedIn groups that can provide insights both on the finer technical details of financial instruments, making them a valuable resource for finance professionals and organizations. When a finance professional projects value and authenticity on social media, your company benefits as a top resource for not only premiere employees, but as a digital leader for future business success. How does social media benefit a finance professional? Let’s consult Henry, a Senior Accountant! 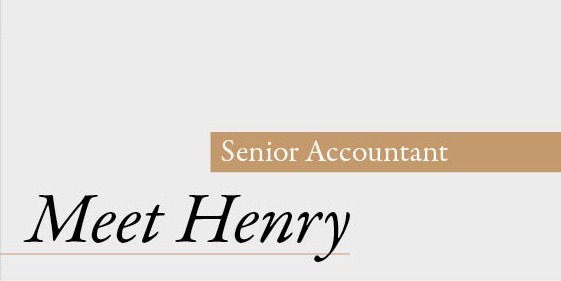 As a Senior Accountant, Henry is responsible for completing audits, tax preparation, and filing of forms. A Senior Accountant typically has more than 3 years of experience, and directs lower tier staff on specific projects. Social media is a unique content distribution platform, giving professionals the ability to showcase intellectual insights and thought leadership. Social media can also be used to promote your organization, and help “humanize” the brand. Essentially, finance professionals want to make Facebook, Twitter and other social media outreach programs work for themselves and their organizations – instead of the other way around. Potential financial prospects are hungry for advice and tips that will help them take the next steps in their career. Generating videos, blog entries, short white papers,case studies – that help solve a problem or increases their awareness on a hot topic in the industry is optimal for business authority. Joining relevant discussion groups is a great way to connect with customers and prospects to increase your authenticity. There are also many experts on Linkedin, Facebook, Twitter and other outlets that are effectively sharing insights and engaging in meaningful conversation and collaboration that drives their professional value forward. Finance experts are no exception, and many successful professionals and organizations are buying into the power of social media to advance their careers and companies. Looking to hire a Senior Accountant like Henry? In addition to being your source for the most up-to-date salary data and workplace trends, we also provide you with the consultative advice to recruit and retain the accounting and finance professionals you need.